Henry Montgomery, Jr. was born May 21, 1904, in Fishkill Landing, NY. The area was incorporated as Beacon, NY, in 1913. 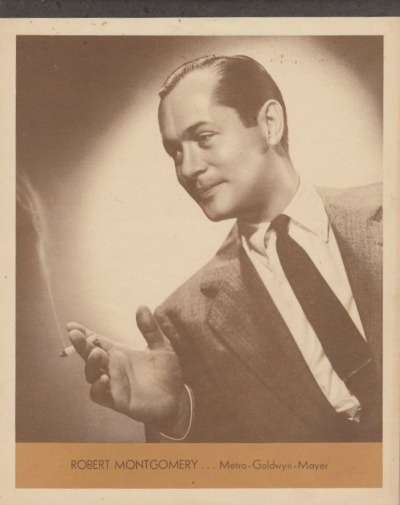 By 1928, Henry lived in New York City, and was known as Robert Montgomery. NYC is 77 miles directly south of Beacon. In the early 1930s, Bob and Betty purchased property just south of Patterson, NY nearby the small hamlet of Towners, NY. 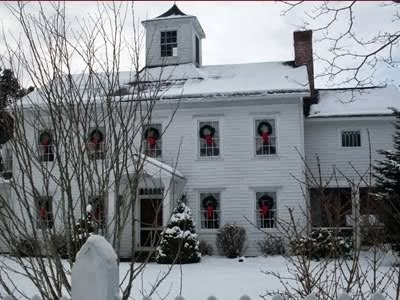 The Montgomery family would use the farm as their summer vacation home. The distance between Beacon and Patterson is 26 miles. After their divorce, Betty moves to Towners and resides there until her death in 1992. In 1970ish, Bob and Buffy purchase their last residence, Hollow Brook, an estate near Canaan, CT. Canaan is 66 miles northeast of Beacon. 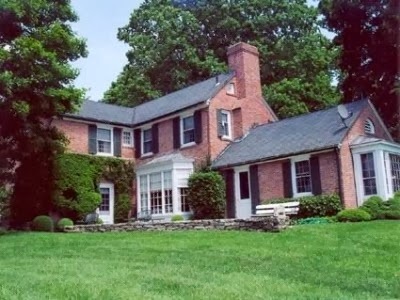 Hollow Brook is Bob's residence when he passes on September 27, 1981. Buffy remains on the property until her death in 2003. Just had to post the smile - love this shot of Spike from The Miniver Story. And am I the only person who can barely watch the movie without crying? This portrait totally fascinated me when I first ran across it. Wow, was Reginald Denny ever this handsome? The MGM photo no. indicates it was taken in early 1931, so he was 39 at the time. Not bad for an "oldster." Wonder who the photographer was, it is a really good portrait. And then there was the boyish charm of Wayne Morris. Like Bob, he joined the U.S.N.R. prior to U.S. participation in WWII, becoming a navy pilot who flew 57 missions off the carrier Essex in the pacific theater, became an actual ace and was awarded three Distinguished Flying Crosses. Impressive stuff. And, like Bob, he had a great smile. 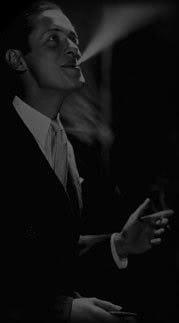 In the mid 50s, Bob will have his own TV show, "Robert Montgomery Presents," as will Durante, "The Jimmy Durante Show." Not exactly original show titles, but there is no confusion as to what the shows are about. Of course, Jimmy ended all of his shows walking off into the darkness under a single spotlight, stopping briefly to say "Goodnight, Mrs. Calabash --- where ever you are!" Just a great finale. 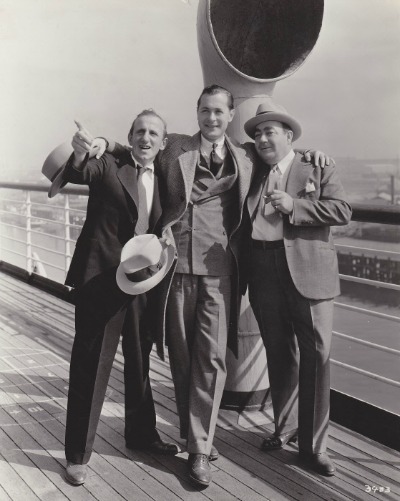 Eugene Pallette, a man of size with a great gravelly, bullfrog voice, made over 240 movies, many of them silents. He was of "normal" statue in his early career, making numerous westerns. In the late 1920s, he started developing the girth that becomes a large part of his persona and turns primarily to comedies. I have to admit it seems odd to think of him competing with Adolphe Menjou for the girl! Palette was great as the valet/manservant. 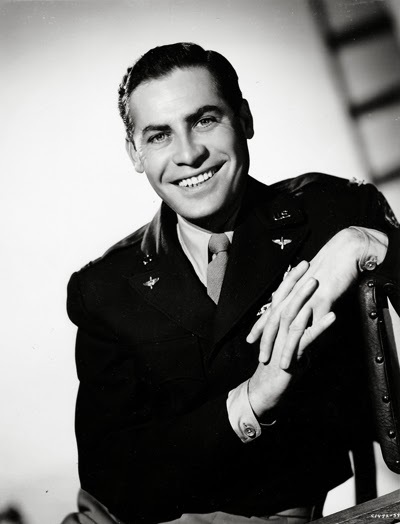 He gave hungover Bob a rough time in both Made on Broadway (1933) and Unfinished Business (1941). He is one of a trio of my favorite manservants, competing with Eric Blore and Arthur Treacher. Well, they actually share a special place in my heart for actors who have brought much joy into my life. Oh, yes, I know ... the kiddies have been back to school for a couple weeks now. But, heck, I don't want to have to wait a whole year to do this entry. These are unused paper tablets c.1940. The paper is still good if browned a tad, otherwise they are in great shape for their age. It is interesting to think of the items that survive the years, and frustrating to think of those that have not. Bob and Myrna were great together. I'm sure being good friends helped with the chemistry between them. 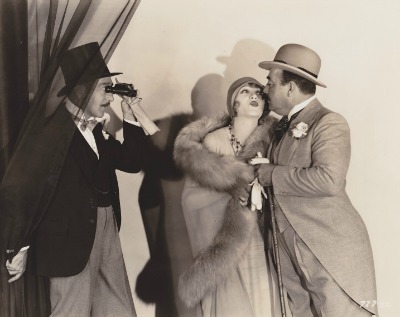 Per earlofhollywood.com, they were to be teamed again in Love on the Run (1936), but their roles eventually went to Crawford and Gable. I doubt Bob and Myrna could have saved that movie either. Anyway, 'tis too bad they didn't make more movies together. And, not having anything at all to do with the above topic, TCM has a great schedule for this coming Saturday night: Lifeboat (1944) with the hunk John Hodiak; Abandon Ship (1957) with Ty Power giving one of his better performances; and Titanic (1953), a great soaper and tear jerker. That should keep you from signing onto a cruise for another year. Continuing the discussion of Bob the immaculate dresser ... the picture below was used in a 1970 newspaper feature article on the well-dressed man. 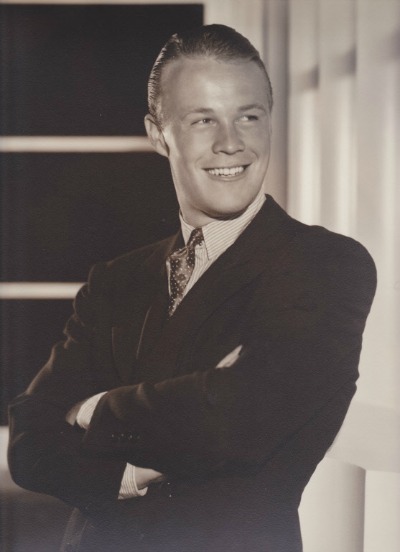 The caption fits Bob perfectly: "Robert Montgomery, star of film and television, dresses according to the common-sense rules. Shirt cuffs show below the jacket, jacket collar rides comfortably but snugly around the neck, shoulders of jacket are not over-padded. A good example of how to wear clothes, not let them wear you." Dressing well was always part of the Montgomery psyche. 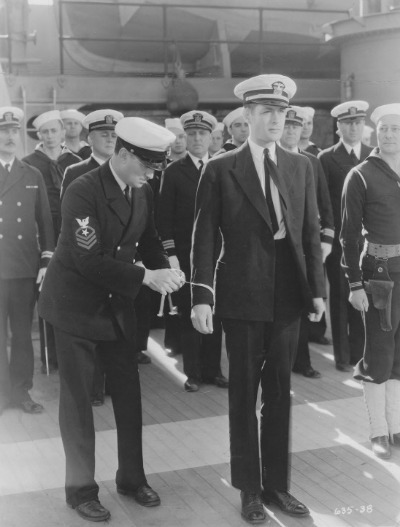 In the photo below from Hell Below (1933) Bob is being dishonorably discharged from the navy, but that doesn't stop him from dressing well. The collar is snug, the jacket sleeves cover the shirt cuffs --- per navy guidelines --- and his pants cuffs come to just above the top of his shoes. Note the baggy pants that extend to the heel of the shoes of the other sailors. Of course, having your own personal valet on the set does give one an advantage in keeping up one's appearance. Getting down to the basics, Bob looked just great without any clothes! 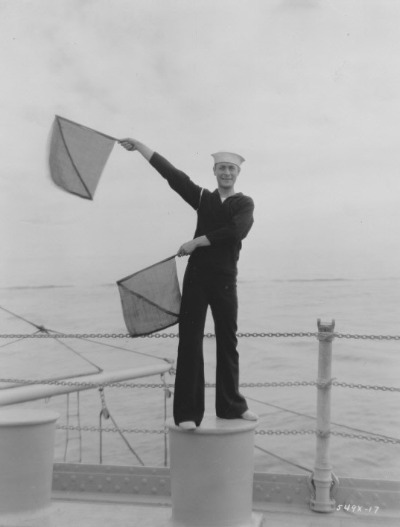 Playacting the sailor in early 1931. 25 years later, being the real thing. 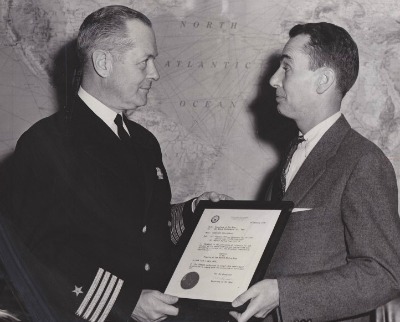 Feb. 8, 1956, Henry Montgomery, Jr. receives his promotion to captain in the naval reserves. 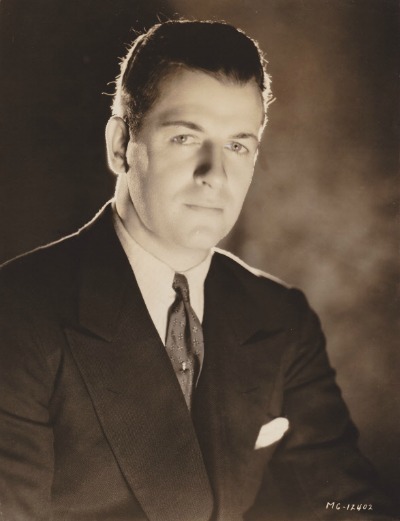 Robert Montgomery was not loved by all who knew him. 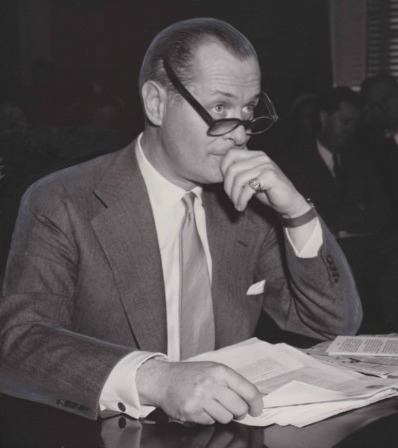 If you consider that he obtained great success in the movies as well as TV, took what has become a very unpopular stand in the 1947 McCarthy hearings and gave much effort and dedication to the, egads, Republican party...well, you can imagine the number of his detractors in La-La Land. 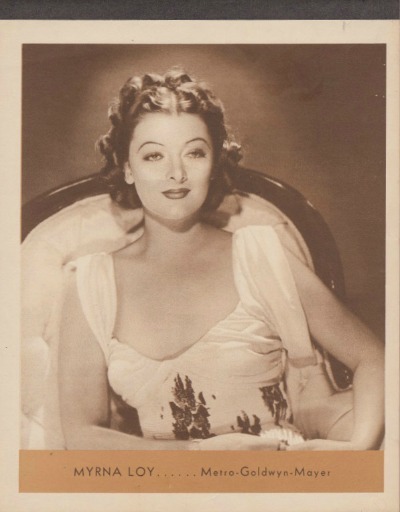 Whitney Stine in 50 Years of Photographing Hollywood: The Hurrell Style, provides a brief write-up of George Hurrell's working relationship with Robert: "He was rather cold and uncommunicative on the lot, but he was also overworked, having made eight pictures in 1930 alone. In the gallery, he reacted very little to Hurrell's shenanigans and appeared indifferent to music of any kind. He remained stoic even when a wild foxtrot blared forth from the phonograph. Still, Hurrell was able to take interesting shots by paying more attention to the lighting than to Montgomery's expression. Although unsmiling and bored, a sly, whimsical quality often came through. 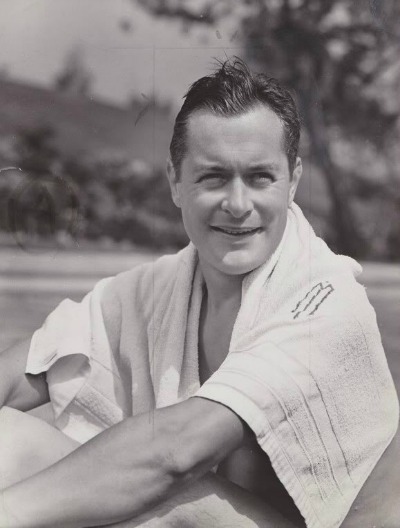 Twenty years later, when he was producing Robert Montgomery Presents, Hurrell telephoned on one pretext or another and found him still the frosty, aloof man whom he remembered so well." And lastly, Mark Viera, in his book Irving Thalberg: Boy Wonder to Producer Prince, provides a recounting of the meeting of Robert and Scott Fitzgerald at a fancy party given by the Thalbergs: "When Robert Montgomery arrived from a polo match still dressed in a riding outfit and asked Taylor (an MGM writer) for an introduction, he could not find Fitzgerald. Then Fitzgerald suddenly reappeared, gin martini in hand. Taylor made introductions, but Fitzgerald stared at Montgomery and asked dully, "Why didn't you bring your horse in too?" Montgomery was not amused. He turned on his heel and walked off." 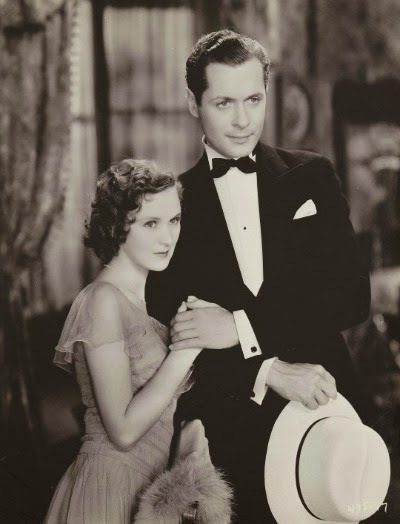 Robert Montgomery was not a perfect man, nor are any of us. He was a highly intelligent, witty man who developed from a shallow beautiful youth highly successful in the movies to a Renaissance man who pursued several vocations, dutifully served his home and country and in the end achieved his early stated life's goal to become a country gentleman of merit. Now that is a man to admire. The kind of man so lacking in today's society. More's the pity.